You can reduce operating costs, boost employee morale and gain competitive advantage through the use of “rolling billboards”. When was the last time you carefully looked over each of your delivery trucks, sat down in the driver's seat, checked the body interior and looked carefully at truck operating costs? Have you recently taken a big step back to look at your trucks from your customer's perspective? Do existing and potential customers receive favorable impressions when they see your trucks in the neighborhood or do they wonder if you are going out of business? It may be time to check out your trucks and then visit truck dealerships to see how you may benefit from updating and/or replacing some or all of your vehicles. This article will give you some ideas and trend information that may influence your delivery truck decisions. The new trucks I’ve test driven recently have greatly improved handling characteristics over older models. Smoother ride reduces product damage while adding to driver comfort. The current tax law also offers outstanding benefits for equipment purchases. There is a point in every truck's life when repair simply doesn't make sense. WardsAuto.com reports Class 5 and 6 truck deliveries through July 2004 are up 28% and 48% respectively. These classes are the leaders for furniture delivery applications with bodies ranging from 16 to 28 feet and overall weights of 16,000 to 27,000 pounds. Deliveries are also up by smaller percentages for other medium duty trucks between Class 3 with a maximum weight of 10,000 pounds and Class 7 with a maximum weight of 33,000 pounds. A significant reason for preferring trucks with overall weight less than 26,000 pounds is that drivers of heavier trucks require CDL licenses and additional training under regulations that went into effect on July 20, 2004. These rules also immediately affect CDL drivers licensed after October 20, 2003. In looking for new trucks you will have many choices. Here we will focus on medium duty class box trucks because they are predominant. Manufacturers have provided major interior improvements for driver and passenger. Designers have turned their attention to improving interior comfort, as well as offering better control access and instrumentation visibility. Introducing the 2005 Mitsubishi Fuso new models, Robert J. Aquaro, vice president of product assurance noted that many medium duty truck drivers do not come to their jobs with extensive driver training, so car-like operating characteristics may speed a new driver's trip up the learning curve and contribute to improved productivity and safety. Automatic transmissions are typically the standard in newer models with operating performance like SUV's or pickups. Yes the vehicle is considerably larger but the similarity of controls to cars lets the driver keep his attention on the driving. You have many choices between conventional trucks and Low-Cab-Forward trucks (LCF). Conventional trucks with hoods are the most popular in North America with approximately 75% of the market. LCF trucks are slowly gaining ground, despite their premium price. Primary selling points for LCF trucks are ease of maneuvering and parking in congested cities and the fact that the same length LCF truck can carry up to 200 more cubic feet of cargo. Isuzu, Mitsubishi Fuso, and UD/Nissan Diesel make only LCF trucks. Just as the GM and Chevy LCF trucks have identical cabs by Isuzu, Ford and International Truck and Engine Corp have introduced LCF trucks manufactured by their joint venture, Blue Diamond. Ford and International's entry provides a loyal customer base and a wide distribution network which will expand the market. You can expect to hear plenty of arguments on both sides of the Low-Cab-Forward versus Conventional truck question. 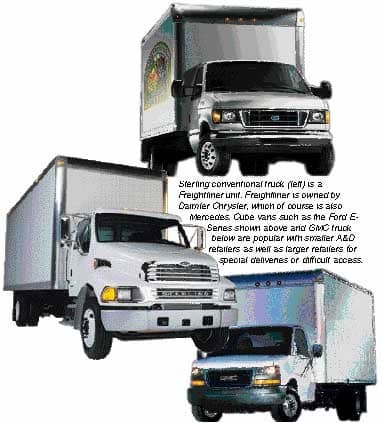 Daimler Chrysler owns Freightliner. Freightliner in turn owns Sterling which sells both conventional and LCF vehicles. Paccar Corporation owns Peterbilt trucks and Kenworth. Toyota holds controlling interest in Hino Diesel which has a small share of the conventional and LCF market. Across the board, the manufacturers are building better trucks that meet ever more stringent emissions standards with competitive offerings. Another trend is for lower profile trucks where the dock height is 42 inches instead of 48 inches. This cuts the overall vehicle height and reduces mishaps with overhanging branches and low bridges. 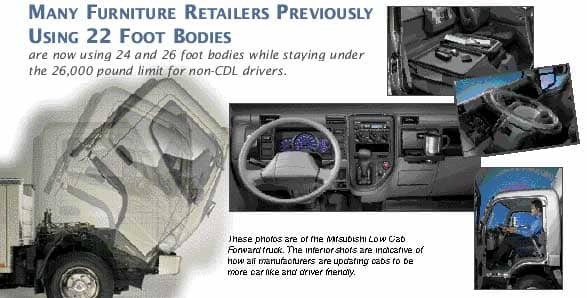 Many retailers previously using 22 foot bodies are now using 24 and 26 foot bodies while staying under the 26,000 pound limit for non-CDL (Commercial Drivers License) drivers. Ease of cab entry and exit. The maximum waist size or height of driver and helper(s) that the truck will accommodate. Air ride suspension with dump valve that lowers the rear of truck 4" for difficult locations and docks. Air ride seat for driver and helpers. Maximum weight capacity without requirement for CDL license (Under 26,000 pounds). Breakaway rear mirrors for clearance or if the mirrors get bumped. Multiplex wiring and LED lighting systems for reduced maintenance. After you have selected the appropriate body for your truck along with its own set of options for tie down, lifts, ramps, doors, etc., you will then select graphics to maximize your company's image. There is great value in paying careful attention to optimally using delivery trucks for effective and efficient advertising. In fact, they can be of greater value than static billboards because they move throughout the communities while you deliver, and function as a moving, highly visible advertisement on highways. You can use vinyl decals, vinyl wrapping. interchangeable displays or a combination of all three. Painting of ads on trucks has almost disappeared. With interchangeable displays, the latest digital printing technology allows you to economically have the most current promotion out on the street. These displays travel through your customers neighborhoods and sit in their driveways, making a big impact at the last point of the sale. Joe Lapekas of TruckSkin, a supplier of interchangeable displays, has developed a good way to consider the advertising value of truck graphics. For example, the quantity rate for billboards in Atlanta is $610 per month. A truck is the equivalent of 2 billboards or $1,525 per month or $18,300 annually. San Francisco is much more expensive for billboards at $1,100 per month which makes the value of promotional messages that furniture retailers place on trucks $2,750 per month and $33,000 per year. Truckskin has representative values throughout the USA for comparison. The sum total benefit of selecting and maintaining the appropriate truck for your operation is that the appropriate choice can improve your profits through reduced operating costs, have a positive affect on your employees and provide a competitive advantage.